Travelog / Travelogue / Travellog / Travellogue, or however you spell it! Our family spent 4 nights in Sarlat, in the Dordogne region of France, in late May, 2005. Sarlat is pronounced sar LAH, with the final T silent. It consists of a central old city and a surrounding modern town. The train station is located about half a mile (1 km) uphill from the lowest corner of the old city, which was in turn located about half a mile from our hotel. Our hotel was La Villa des Consuls, located in the old city. The hotel is actually located right across main street (Avenue of the Republique) from the Credit Lyonnais office (look for an ATM surrounded by mirrors), but the hotel entrance is off a side street that is reached up a ramp from main street. That ramp is approximately 50 yards / meters up the street from the Credit Lyonnais office. Our suite in the hotel was new, and had 11-foot ceilings. 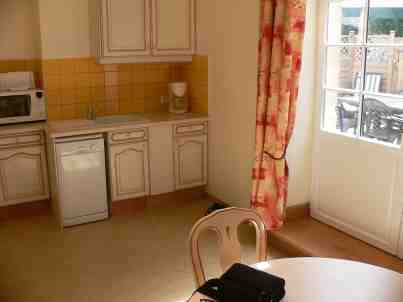 The two rooms each had a separate air conditioner / heater with remote control. We had a kitchen and a large private patio complete with gas-powered grille. We had a narrow balcony overlooking main street, from which we could see that Sarlat essentially rolls up the sidewalks about 7 PM on weekdays. This might change later in the summer when European tourism gets into full swing. We did not see a Starbucks or a McDonald’s in Sarlat. We did find two Internet cafes, a block apart on main street just outside the old part of the city. They charged 1.5 to 2 euros per 15 minutes, and you needed to declare in advance how long you would be there. The computers had French keyboards, which will transform American touch-typists back to 2-finger typists. No VOIP or other phones were available, and there were very few customers. A big attraction of Sarlat and nearby towns is the caves nearby with prehistoric paintings. The most famous is Lascaux, which is closed to the public. The French have constructed a replica named Lascaux II near the original. The only actual painted cave open to the public, or at least to 200 of them per day, is Grotte de Font-de-Gaume. Our guide, Philippe Mouret, was able to obtain tickets to both Lascaux II and to Font-de-Gaume. The paintings are truly remarkable. The folks who painted them used torches for illumination and wooden scaffolding to reach the ceiling of the cave, and combinations of minerals to create various colors. They painted animals utilizing the contours of the cave walls. The paintings are fairly large, with the largest animal being 15 feet long. They painted some animals at a 45-degree angle, not just in profile. 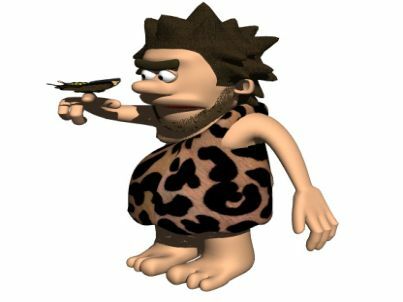 And, they did this up to 18,000 years ago! Compare this with the builders of the Egyptian pyramids (6000 years ago), the New Testament writers (2000 years ago) and the writers of the US declaration of independence (225 years ago). 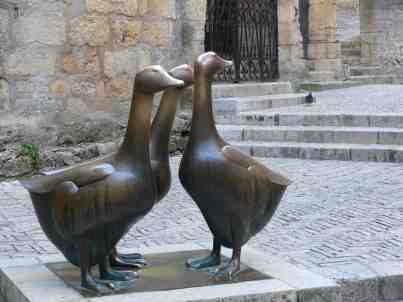 Sarlat is also famous (or infamous) for pate de foie gras. This translates to paste of fat liver. Farmers around Sarlat force-feed geese to enlarge their livers, which are then served as a delicacy. Another specialty of the area is truffles. A few hours before it was time to leave Sarlat we asked the desk clerk at our hotel to reserve a cab. He called every cab company in town (evidently, 1 cab = 1 company), but not any cab was available...they were all in use giving tours or delivering French Mother's Day gifts. So, we had to lug our luggage the mile or more to the train station, which took about half an hour.